It seems that manufacturers have gotten the hint and, compared to only 25% of the seats getting a good rating in 2008, this year, 48 out of 53 new models got a best bet rating. 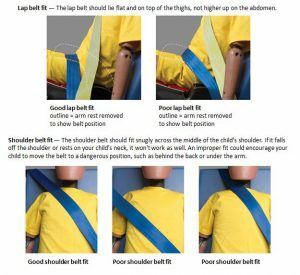 A best bet rating means they are likely to provide good belt fit for a four to eight year old child in almost any car, minivan, or SUV. Parents should remember that, in spite of some state laws, booster seats are recommended for children once they outgrow their child seat, at approximately age four, until they’re big enough for a seat belt to fit properly, low on their hips, without riding up over their abdomen. For the average child that can be anywhere from nine to twelve years of age. Another thing to remember is that child seats have an expiration date. Sunshine and trapped heat inside a car over long periods of time can degrade the plastics and synthetic fabrics used in the seat structure and belts. If you’re considering using a hand-me-down seat, you’ll want to check the expiration date located underneath the seat.